Aegle marmelos, commonly known as bael, Bengal quince, golden apple, stone apple, wood apple, bili, is a species of tree native to India. It is present throughout Southeast Asia as a naturalized species. The tree is considered to be sacred by Hindus. Its fruits are used in traditional medicine and as a food throughout its range. The edible fruit tree is called "belada mara" and the religious tree "bilva" or "bilpathre" in Kannada. The fruits are known as Belada Hannu (edible variety), Bilva (sacred variety) in Kannada, "bela" in Oriya and Maredu (in Telugu). Bael is the only member of the monotypic genus Aegle. It is a mid-sized, slender, aromatic, armed, gum-bearing tree growing up to 18 meters tall. It has a leaf with three leaflets. Bael occurs in dry forests on hills and plains of northern, central and southern India, Pakistan, southern Nepal, Sri Lanka, Myanmar, Bangladesh, Vietnam, Laos, Cambodia and Thailand. It is cultivated throughout India, as well as in Sri Lanka, the northern Malay Peninsula, Java, the Philippines, and Fiji. It has a reputation in India for being able to grow in places that other trees cannot. It copes with a wide range of soil conditions (pH range 5-10), is tolerant of waterlogging and has an unusually wide temperature tolerance (from -7°C to 48°C). It requires a pronounced dry season to give fruit. The bael fruit has a smooth, woody shell with a green, gray, or yellow peel. It takes about 11 months to ripen on the tree and can reach the size of a large grapefruit or pomelo, and some are even larger. The shell is so hard it must be cracked with a hammer or machete. The fibrous yellow pulp is very aromatic. It has been described as tasting of marmalade and smelling of roses. Boning (2006) indicates that the flavor is "sweet, aromatic and pleasant, although tangy and slightly astringent in some varieties. It resembles a marmalade made, in part, with citrus and, in part, with tamarind." Numerous hairy seeds are encapsulated in a slimy mucilage. The fruit is eaten fresh or dried. If fresh, the juice is strained and sweetened to make a drink similar to lemonade. It can be made into sharbat (Hindi) or Bela pana (Oriya: ବେଲ ପଣା) or bel pana (Bengali: বেল পানা), a refreshing drink made of the pulp with water, sugar, and lime juice, mixed, left to stand a few hours, strained, and put on ice. One large bael fruit may yield five or six liters of sharbat. If the fruit is to be dried, it is usually sliced and sun-dried. The hard leathery slices are then immersed in water. The leaves and small shoots are eaten as salad greens. The Tamil Siddhars call the plant koovilam (கூவிளம்) and use the fragrant leaves for medicinal purposes, including dyspepsia and sinusitis. A confection called ilakam (இளகம்) is made of the fruit and used to treat tuberculosis and loss of appetite. In the system of Ayurveda this drug finds several and frequent therapeutic uses in different forms and recipes. They are prescribed in a number of diseases such as gastro intestinal diseases, piles, oedema, jaundice, vomiting, obesity, pediatric disorders, gynecological disorders, urinary complaints and as a rejuvenative. Besides the wide medicinal utility the plant and its certain parts (leaves and fruits) are of religious importance since the tree is regarded as one of the sacred trees of Indian heritage. The fruit is also used in religious rituals. In Hinduism the tree is sacred. It is used in the worship of Shiva, who is said to favor the leaves. The tri-foliate form of leaves symbolize the trident that Shiva holds in his right hand. The fruits were used in place of coconuts before large-scale rail transportation became available. The fruit is said to resemble a skull with a white, bone-like outer shell and a soft inner part, and is sometimes called seer phael (head-fruit). However, it is quite likely that, the term 'Seer Phal' has coined from the Sanskrit term 'ShreePhal, which again is a common name for this fruit. Many Hindus have bael trees in their gardens. In the traditional Newari culture of Nepal, the bael tree is part of a fertility ritual for girls known as the Bel baha. Girls are "married" to the bael fruit and as long as the fruit is kept safe and never cracks the girl can never become widowed, even if her human husband dies. This was seen to be protection against the social disdain suffered by widows in the Newari community. Research has found the essential oil of the Bael tree to be effective against 21 types of bacteria. It is prescribed for smooth bowel movement to patients suffering from constipation and other gastrointestinal problems. 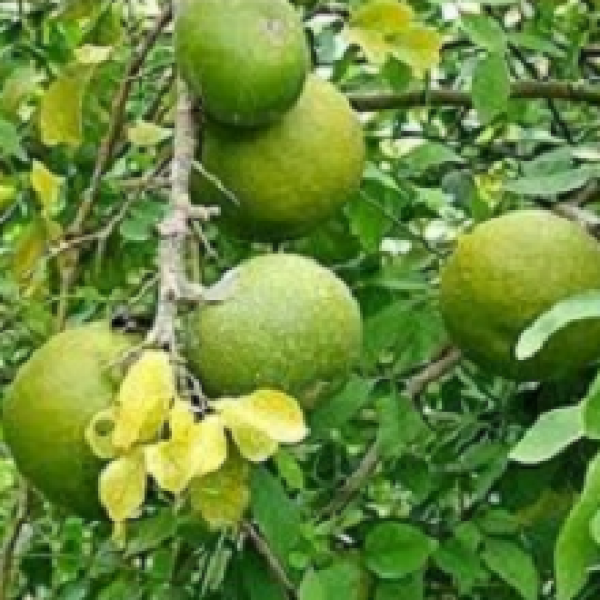 Research also indicates that unripe Bael fruit is effective in combating giardia and rotavirus. While unripe Bael fruit did not show antimicrobial properties, it did inhibit bacteria adherence to and invasion of the gut (i.e. the ability to infect the gut).